Lafata Auto Body is an independently owned facility providing vehicle owners with precise vehicle collision repair and full detail services. We focus on same day turnaround on minor bumper, door, and ding repairs. I-CAR Gold Certified Technicians service minor dings to major collision damage and expert paint matching systems resotre your vehicle to its pre-collision state. 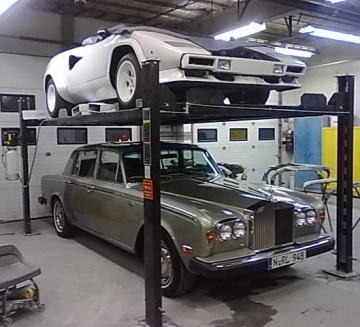 Our 15,000 square foot facility features state of the art equipment, indoor storage facilities, and an expert team to produce superior workmanship on all foreign and domestic vehicles. Lafata Auto Body's technicians each have more than 20 years of industry experience. Every vehicle is an investment. We strive to make each collision repair convenient and simple for our clients. We have cultivated relationships to form a one-stop-shop approach for assistance in every aspect of repair. We also offer 24 hour towing serives to ensure that your service experience is as smooth as possible. Specializing in Luxury Vehicles such as Rolls-Royce, Acura, Infinity, Maybach, Bentley, Land Rover, Prosche, Ferrari, Lamborghini, Hummer, Cadillac, Jaguar, Lincoln, Mercedes-Benz and BMW. Specializing in collision center damage repair, custom kits, restoration, detail services for all makes and models foreign and domestic including Chevrolet, Cadillac, Ford, Chrysler, Dodge, Jeep, Porsche, Infiniti, Lotus, BMW, Mercedes Benz, Ferrari, Land Rover, Nissan, Toyota, Honda, Rolls Royce, Audi, Bentley, Lexus, GM, Hummer, Lamborghini, Lincoln for all Southeast Michigan communities.